It makes me wonder if there is a problem with the Chego business model. They apparently closed because of a problem with reupping their lease. I’m sure their landlord wanted to raise the rent, but how much leverage would the landlord have? That strip mall is memorable as being the most forgettable strip mall in the history of the world. And when Chego closes, you and everybody you know will never even cast a glance at this strip mall again. So I have a hard time thinking the rent was going to be jacked up to a ridiculous degree. So that makes me think that Roy was losing money charging $8-$9 a bowl in light of rent anywhere in the CC/Palms area. A typical ticket was $10-$15 with little to no tips and virtually no booze money (I’m sure they were not taking in much from their secret kickback deal with the liquor store next door). While Saturdays were pretty busy for dinner, the crowds had stopped being overwhelming a long time ago. Maybe Roy needed to move to a locale where the rents were an order of magnitude cheaper. If that’s true, it’s a darn shame. If all that is true (and again I am stressing that I don’t know anything; this is all conjecture), it means Roy’s company may be undercapitalized, as he couldn’t afford an expansion into a larger space or investing in a beer/wine license. Anyways, I am going to miss Chego dearly. In terms of bang for your buck, it was still my favorite meal in LA, and probably the best example of the emerging genre of “Asian stoner food.” Of course, I’ll make it to Chinatown to check out the new digs. But I’ll always miss the original (of course, I won’t miss that crappy little parking lot). 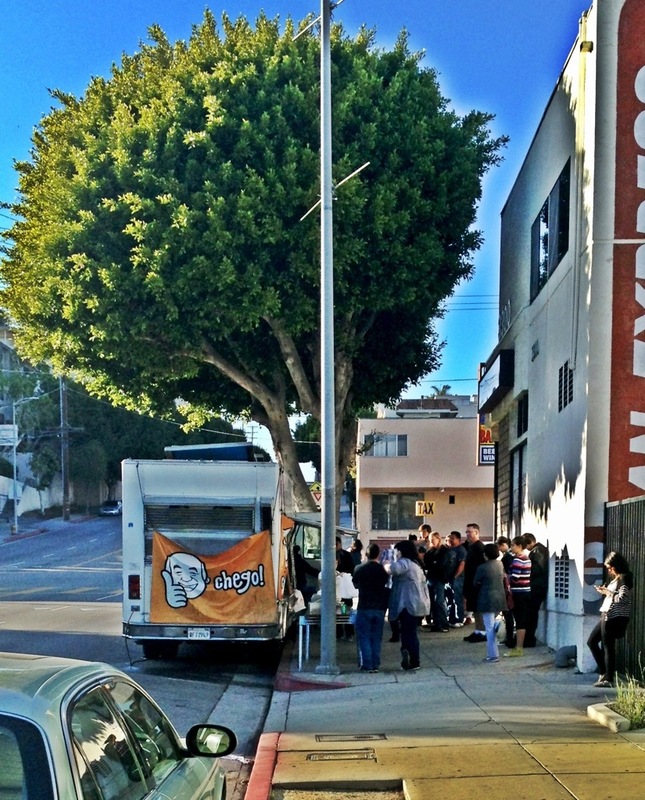 Updated with a photo of Chego’s last dinner service. It wasn’t really a party — it was more like a funeral, with people lining up to see the casket and order one last Chubby Pork Belly Bowl. I saw Roy sitting in the driver’s seat of the truck for a pensive moment. When I caught his eye, he gave me a sad peace sign. See you in Chinatown, Roy.